Although a monthly favourites is long overdue, with the weather being so favourable I've actually not been using that much. When it's hotter than hell outside, I don't really spend time beautifying myself. It's all going to melt off, so I figure I'd just save myself the bother. Not pictured but an all year round favourite is SPF. I'm onto my third bottle of the Soltan Protect and Moisturise SPF50 now and I've also just cracked open my second bottle of La Roche Posay's Anthelios XL Ultra Light Fluid SPF50+++ too. Safe to say I'm firmly committed to sun safety and if you aren't in the habit, please get on it STAT. Once my skin's been protected, my only other goal is to even out my complexion a little bit. I'd normally reach for Glossier's Stretch Concealer but I've got a new favourite for all over. Step up Charlotte Tilbury's Light Wonder Foundation. Over the years I've tried to purchase this on counter many times. Every single time my shade (2 fair) has been out of stock. I finally took the plunge and ordered it online, and so far I have zero regrets. It's skin-like, lightweight and blends seamlessly: IT Cosmetics CC Cream, it's been good but you've been replaced. Aside from a teeny bit of base, the only other thing going on my face has been the Essence Lash Princess Mascara. After my last Lash Paradise mascara dried up, I felt like I needed to branch out and try something new. After a good trawl of the internet (reddit mainly), I felt like I owed it to myself to give this mascara a go. Review after review, people seemed to love it and I'm actually with them on that. I'm not really one for the false lash look but one good coat and my lashes are dreamy. It delivers a lot of length; just enough volume and it separates like no other. I'm obsessed and for £3.30, you best believe I'll be repurchasing it. The only downside is the packaging; it's a bit cutesy for me but I can look past it for the results. When it's hot outside, there's nothing better than a face mist. The one I love isn't cheap but my god is it refreshing. I am of course talking about Caudalie's Eau de Beaute. The scent is an instant pick me up and the product itself really perks up my skin. It's a good one to whack in the fridge for an even cooler treat. It's a favourite for a reason and this guy will not be leaving my side for the foreseeable future. Last but certainly not least is the Glossier Coconut Balm Dot Com. This one's made the cut because it just does it all. Dry patches: covered. Missing a bit of a highlight: covered. Eye gloss: sorted. I can list a million things that this multi-purpose balm can do but the best thing of all is that it smells like holidays while it works. It's so good, I've got two backups. Times change, and it would seem that my makeup bag has too (it's been a while I know). I've spent a good while shopping my stash and working out what I do like and don't like. With that, there's been a lack of consistency with regards to what's on my face. I mean if I walked you through all the products I revisited in a week, we'd be here for days. No one wants to read that, trust me. After experimenting with lots of looks, here's what's stuck for the past two months or so. Base wise, you'll see that nothing has changed really. It's still a Becca Backlight Priming Filter (£32) and tinted moisturiser combination. I'm still working my way through the Nars Pure Radiant Tinted Moisturiser (£30) and I do like it, but I'm curious to see what else is out there. If you haven't tried it, it's wears beautifully and the shade range is brilliant. As for the Becca Primer, it goes without saying that this product will probably be in my makeup bag forever. The only product that I think could sway me otherwise would be the Laura Mercier Foundation Primer (£30) in the Radiance finish. That primer is equally as phenomenal and the packaging is a touch easier to work with. I'll keep you posted; though thinking about it has me itching to add it to my basket immediately. Unsurprisingly, my pick of mascara hasn't changed either. I still very much enjoy using L'Oréal's Lash Paradise Mascara (£11.99). I'll admit that I've not really tried anything else, but when your current tube is that good, there really isn't a need. With that being said though, I believe today is the day that Glossier are launching or announcing their very own mascara, so watch this space. Speaking of Glossier though, you might have noticed that my beloved Boy Brow (£14) is missing from the mix. I still love it, but given the Reddit love for this next product, I had to branch out for a hot minute. Essence's budget friendly 'Make Me Brow' (£2.50) has been lauded in online forums for being a great dupe for both Boy Brow and Gimme Brow; so into my makeup bag it went. I paid €3 for my tube in Prague, which is peanuts compared to Glossier's heftier £14 price tag. So, how is it? While I wouldn't say it's a formula dupe, the Essence Gel is fantastic for the price. It holds my brows in place all day (minus the crunch); the colour is perfect for me (Glossier's pulls slightly warm on me) and it's a doddle to apply thanks to its teeny tiny wand. For now, I'm very happy with my cheap as chips brow gel. I may stray back to Glossier at some point, but if you're on a budget I'd highly recommend giving the Essence one a go. As my base makeup is fairly light in terms of coverage, it goes without saying that I touch up with Glossier's Stretch Concealer (£15) where I need it. I've spoken about this one a lot, so I'll spare you all the spiel. For me, it's the perfect concealer and if you like a dewier finish and don't have much to cover, you must give this a try. My lipstick is probably one you've heard a lot about too. It's Charlotte Tilbury's Matte Revolution lipstick in the shade 'Pillow Talk' (£24). I'm not sure that it's part of the permanent collection yet, but it is in stock as I write this, so run! As we're in the softer makeup months at the moment, I've been patting it onto my lips instead of applying straight from the bullet. The result is a natural, dusty rose flush that's pretty and so easy to maintain. I love Charlotte, but this girl has no time to be faffing with lipliners and mirrors at the moment. Sorry. I know I've literally just mentioned Hoola (£25.50) in a favourites post but I genuinely have been using it every single day with the Zoeva 127 brush (£13) I also mentioned. The slightest amount, when applied just right gives me the perfect amount of bronze. I've hit pan on it (which I've not done on a face product in a long time), so that really says it all. After not getting on with this bronzer for so long, it feels so good to finally understand why the rest of you love it so much. I finally get it guys, I'm with you. It took a while, but we got there. When I first bought this Tarte blush (shade is Tipsy), the obsession was real. Despite its immaculate appearance, it was well loved before it got lost in my stash. Now it's back out, I'm reliving those first days all over again. A small pop of this colour on the apples of the cheeks and you just look better. It's borderline magic. Imagine the most beautiful blushing bride and that's what this blush does for your face. I don't think you could ask for anything better really. The only downside is that it's been DISCONTINUED. I wrote that in caps because I just went to find a link for you guys and found that out for myself. Why do they always do this to the products I love. RIP Tipsy. So, dupes anyone? Once I'm all done, I simply look like a better version of myself. My features haven't been altered in any way, but the addition of some colour brings a bit of life to my complexion. Heavens knows I need it! Running is perhaps the easiest and cheapest way to get fit; you simply put on your trainers and go. That's all that is required. I never had a problem with this aspect of it but I very rarely came back from a run and thought 'I enjoyed that'. What happens when we do things we don't enjoy? We tend to stop doing them. So two or so years ago I pretty much gave up on running. It wasn't the sport for me and in my mind my body wasn't really capable of doing it well. Fast forward to now and so much has changed. I look back with a tinge of regret, because I would've been further along my journey had I just stuck with it. So for anyone who's starting out running or wants to pick it up, here are a few things that have helped my progress (and enjoyment) tremendously. The best thing I did to help me along was to download the Nike Run Club App and actually stick to the plans it builds for you (the My Coach feature). I've dropped out of more of these plans than I care to admit to, but actually sticking to them and not making excuses has without a doubt improved my performance. You can adjust the plans to whatever your end goal is; they will adjust themselves accordingly as the weeks pass by and I will almost guarantee that you'll be a better runner by the end of it. There's no greater satisfaction than seeing the workouts and weeks tick themselves off, trust me. If a regime isn't quite up your street, give the guided runs a go. Whatever your aim is for your run, there's someone you can take along with you in your ear. Be it a famous face or a celebrated Olympian; Nike has brought them all together to help you be the best you can be. So you're all headed to the App Store right about now... Obviously. Signing up for a race may seem like a terrifying ordeal right now but they're nowhere near as scary as you think they are. It took until last year for me to commit to running a race, but now I can't get enough. Having a concrete end goal will motivate you no end. Come rain or shine, you'll be pounding the pavements because you want to do your best. It also helps to not think of it as a race at all. Most people are there for themselves; like it or not, they probably don't care too much about you or your running. Do what you're comfortable with and allow yourself time to soak it all in. By that I mean to enjoy the cheering crowds; high-five as many amazing people as you can and generally just enjoy the day. I ran the Great Manchester Run 10k last year and it was a day like nothing I've experienced before. I wasn't sure I'd be able to run the full 10k; I was pretty much a nervous wreck waiting for the starting gun. Suffice to say it's still a memory that brings a smile to my face almost one year later. It was uplifting, emotional and such a joyous day and I don't think I've ever enjoyed a run more. It should come as no surprise then that I'm running it all over again this year, and I've also signed up for the Manchester Half Marathon. Am I mad? I mentioned just a second ago that I had doubts that I would be able to run the full 10k. This had absolutely nothing to do with me physically but everything to do with my mindset. When I used to run, as soon as it got hard I would give up. My mind would be telling me that I needed to stop and I always trusted my head. How foolish. With the structure of the Nike plans, I've learnt not to give in so easily. When the going gets tough, instead of giving in, I now dig even deeper and find the strength to get it done. While I'm completing these runs I hate them, but afterwards the feeling of accomplishment is otherworldly. So stop saying you can't; push through and reap the rewards at the end. Also you will get to the end; the finish line is never really that far away. This next tip is relatively shallow I will admit, but the age old saying if you look good, you'll feel good definitely applies here. Whether it's a fresh pair of running shoes, or a great pair of shorts: treat yourself. New gear will not only make you feel the part, but you're probably more likely to act the part too. Plus if you're wearing items you enjoy, the overall result should be much better too. Now that I'm running frequently, I've got quite the stash and I love mixing and matching things and feeling confident when I head out of the door. So rack up the miles and get filling the racks of your closet too! My parting gift to you is probably two things you're probably already doing if I'm completely honest. Exercise isn't something necessarily to be enjoyed, so sometimes you need a bit of outside help. Two things that up the fun factor for me personally are a change of environment or a really great playlist or podcast. So head further afield; explore the podcast charts on iTunes and find what works for you. For me, I like to head to the countryside. There's nothing better than swapping concrete for a woodland trail. Mashing all this lot together has made me a better runner and one that now actually looks forward to, and enjoys doing it. It's no longer a chore or burden and physical benefits aside, I've also found it's had a wonderful effect on my mental wellbeing. So make a note, grab your trainers and see what you're truly capable of. It's probably more than you think. Favourites sort of fell by the wayside a little, but I'm going to try and keep them a recurring item around these parts. This past month I've fallen into a routine if you will and the highlight of it has been these five items. It seemed glaringly obvious that a favourites post was overdue, so here we are. With the weather being quite kind to us over here in the UK, I don't know how I would have survived without my favourite SPF. The Garnier Sensitive Advanced SPF50 for face and neck has been pretty much indispensable. It's light yet hydrating and is an dream under makeup too. All for £6: bargain. If you've had your eye on the La Roche Posay formulas, I'd highly suggest giving this one a whirl before you drop your hard earned cash. I'd say they're pretty much identical (paraben/fragrance/ colour free/ non greasy/ water resistant) bar the price tag: meaning more money for other more fun beauty bits. I've had Benefit's Hoola Bronzer (£25.50) in my makeup bag for longer than I care to admit. Some days it would work and on others it would be a terracotta disaster. I've finally found a way to use it that suits my skin tone and I love it. A light dusting with my Zoeva 127 Luxe Sheer Cheek Brush (£12.99) and my face is bronzed to perfection. It's not often that I hit pan on powder products, but I'm seeing a good deal of pan on this one. There might be a repurchase on the cards.. we'll wait and see. That being said, I'm intrigued to try their Hoola Lite version. Pale people let me know which you prefer! When the days are warmer I tend to reach for my brighter coloured lippies. Something about the sunshine makes me want to embrace a bit of colour in my makeup routine. Lately however my lips have been terribly chapped: deep winter chapped in fact. with my lips in such poor shape I've been forced to turn to the balms I own. The most fun balm in my collection is Glossier's Birthday Balm Dot Com (£10). My lips are no longer chapped but I'm still using it. The glitter combined with the scent and the formula have me head over heels. I just can't seem to put it down. It doesn't hurt that I can take it and reapply it anywhere risk free. Mid-run no problem; on the bus, why not: low maintenance might just be my perfect lip product criteria. I know Westlab Epsom Salts (£4.99) are by no means glamorous or fun but sometimes you just need something that works. My running mileage has increased a fair bit in the past few weeks and my body has been feeling it. Every few days or so, I'll dump some salts into the bath and my body will magically feel a bit better. My legs were battered after this morning and post bath (aka right now) they feel less tight and much happier. These are your basic epsom salts and I honestly don't mind the lack of scent, but you can jazz them up with essential oils if you're that way inclined. Either way, I'm stocked up on them for a good few months and if you're into your exercise, I'd highly recommend picking up a bag for those rougher days. Saving the best for last, I bring you L'Oréal's Dream Lengths No Haircut Cream (£5.99). I pride myself on how few haircuts I've had in my lifetime. I like my hair long and all one length, so it requires very little intervention if I do say so myself. Anything that can help me keep my hair long and looking healthy will always grab my attention and their latest launch was no different. The shampoo and conditioner are full of nasties but this cream really stood out to me. I was using a heat defence spray all over but I noticed my ends were feeling a bit drier than usual. By combining this cream on my ends with the spray everywhere else, my hair is protected from heat styling but my ends are feeling much better. They're definitely softer and any split ends are smoothed to perfection. If you have hair my length, I would definitely recommend giving this one a go. If you're heading to sunnier climes I can imagine this would be great to apply to your ends to protect them from the sun too. Yes you read that right: another week, another city. Amsterdam has been on and off my list of places to visit for quite some time. It's appeal to travellers is timeless but with the small city seeing such a boom in visitors, it can get a little claustrophobic on the canals. Swarms of people aside, the city itself is vibrant; cultured and ultra laidback: perfect if you're looking for somewhere to recharge your batteries. As Amsterdam is packed with things to do as a tourist, I thought I'd provide you with a hotlist if you will. These are places that I felt were either worth the money or were essential to anyone undertaking their first trip to the 'dam. If you're a Heineken fan like me, it goes without saying that you need to visit the cities Heineken Experience. From learning how to pour the perfect pint, to the history of the brand, you'll learn it all. And the best bit: a couple of cold ones are thrown into the ticket price too. I had the most amazing time the afternoon that I took my tour, and I'll carry some of the funnier memories for life. For €18 you would be a fool to miss out; grab your tickets here. Also is it just me or is this bottle wall home decor goals? I'm here for it personally. Amsterdam isn't short of museums but I'd happily recommend passing on Rembrandt and heading straight to the Moco Museum (the others are but a hop, skip and jump away if you are deeply into your art though). The Moco Museum is home to more modern masters of art; namely Banksy and Roy Lichtenstein (hello pop art). Both exhibitions are completely brilliant and while it may be small in size, it's easy to spend a good three or four hours marvelling at the works. Highlights include Banksy's 'Morons' and Roy's 'Crying Girl'. Truly brilliant and admission is just €12.50: bargain. After all the sight seeing stops, you're going to need a pit stop for lunch. While you will never be short of places to eat in Amsterdam, not all restaurants are created equal. Of all the places we were able to eat during our trip, one really stood out: Sir Hummus. It's inexpensive; totally delicious and has the homeliest vibes. If you're a hummus fan, be sure to head to one of their locations when you're visiting. For around €10 you'll be treated to a giant bowl of hummus; four delicious flatbreads and there are plenty of optional extras too. Winning. The tripadvisor reviews are to be believed for this one. Run, don't walk. And also be expected to either wait or share a table: hi new hummus friends! No trip to Amsterdam would be complete without a trip to the A'DAM Lookout. For sweeping views of the city and a sensationally scary swing, head here while the sun's out. Ticket prices vary according to what you fancy, but a basic ticket and a trip on the swing will set you back €17.50 per person. The lookout deck is perfection on a sunny day. Kick back on a bean bag and watch the world pass by right before your eyes. If you fancy being more proactive, there are plenty of lookout points as well as a lovely red horse who's missing his rider. If photo opportunities still aren't doing it for you, take the plunge and have a go of the scariest swing I've been on in my life. If you're afraid of heights; maybe stay away. Otherwise it's an exhilarating way to see the city: and the streets directly below. If you want to take your visit up a notch, there are also ticket options that include drinks and dinner. Perfect for a special occasion. Gratuitous I know but I still can't get over this horse that was tucked away on the A'DAM Tower. Cool huh? I've called him Bullseye. Unlike most trends, it seems that a perfectly radiant complexion is one trend that is here to stay. Over the years, I've tried more products than I care to remember in search of a goddess like glow. Some have worked: some have not. One of the items that worked for me was The Ordinary's Glycolic Acid 7% Toning Solution. At just £6.80 for 250ml, the fact that it works makes it a must have for me. Sadly, I'm 99% sure it's everyone else's favourite too and as a result it's forever out of stock. I used up the last of mine a week ago and lo and behold it was still out of stock. I've struggled to get hold of it before, so it was time to try something new. Something that I could actually get my hands on; and might work too. I'm not unfamiliar with the Naturally Radiant Line from Superdrug but it's taken until now for me to pull the trigger and actually make a purchase. The range promises to 'revive skins radiance and even out skin tone': I'm all in. And even better, the products are affordable and vegan. If they're as good as people say they are in the long run, I doubt I'll be going back to The Ordinary. I'm currently one week into my little trial: so are they any good? I've been using Glossier's Milky Jelly Cleanser (£15) morning and night for months now. I'm still enjoying it, but I wanted something more heavy duty for the evenings. Many moons ago, hot cloth cleansers were my go to for evenings, so it made sense to give their Brightening Hot Cloth Cleanser (£5.99) a go (plus Sali Hughes loves their Vitamin E version). It contains the ranges signature extracts (Kiwi Fruit and Mulberry) and promises to cleanse and gently exfoliate: I'm in. It's been a week and a half at this point and so far I'm thoroughly impressed. The formula is decadently rich; has enough slip for a decent massage and leaves my skin clean, comfortable and not at all irritated. Lately my skin's been fairly reactive to scent (rose water I'm looking at you), so to have my skin be completely unbothered by this is something of a triumph. With that being said, here are a few red flags for some of you. The formula does contain cocoa butter, so if your skin doesn't get along with it, I'd probably stay away. Another ingredient that may cause a reaction in some of you is the added fragrance. It does have a fairly strong scent, especially compared with the rest of the products in my routine. As I said earlier, my skin's going through a funny time with fragrances and hasn't yet reacted badly to this. I can't guarantee the same will be true for you, so maybe give it a try in store before you commit to purchasing. I will also be sure to let you know if anything does change. Otherwise, it's a really great cleanser and I'm loving the results. Why I put off trying this line for so long is beyond me right now. Another success story is the Glycolic Overnight Peel (£5.99). I've read many great reviews of this product and I'm pleased to say that so far it's been brilliant. I've used it three times and each morning, my skin's looked brighter and any marks have faded a little too. Prior to this, the only other peel type product I've used was The Ordinary's 30% AHA/BHA Peeling Solution (£6.30). It was fantastic but inevitably it did cause a bit of irritation due to the high level of AHA's in it. I can't comment on the percentage in Superdrug's offering but I will say that the results are very similar and my skin seems much happier with this one. The only issue I can possibly pick with this product is that the high alcohol content could make it quite drying. Again it's not something I've experienced just yet, but if you've got a drier complexion I'd maybe use it one or two times a week instead of the suggested two to three. Last but not least is perhaps the most talked about addition to the range: the Glycolic Tonic with 5% Glycolic Acid (£5.99). I say most talked about because I've seen so many posts testing to see whether this is a good dupe for the Pixi Glow Tonic (£18). As far as I'm aware, the only thing they have in common is the 5% glycolic acid content. With that, I think it's only fair to judge it for what it is and try not to compare too much. For those of you who were wondering; yes I've tried the Pixi offering and no I was not a fan. It did absolutely nothing for my skin and the scent didn't thrill me either, so I honestly don't get the hype. As with the rest of my purchases, I'm really enjoying this one too. At full price, it's definitely not value for money when compared to The Ordinary's offering but when it's on offer, it's a steal. Performance wise, they perform fairly similarly too. I say this because it has a lower concentration than The Ordinary's one so it's not quite as good, but that does have its benefits. I love my skin the day after using The Ordinary's offering but for a good hour or so after use, my skin is quite flushed and stings. This is completely normal of course but now that I'm using something gentler, I can appreciate how angry my skin was during that brief period. For reference, the Naturally Radiant one has a subtle tingle and doesn't flush my skin at all. First impressions wise: well done Superdrug. Most of the time when I pick a few items from the same range, there's at least one dud. Of the three I've tried so far, they're all products I would probably repurchase at this stage. As I mentioned earlier though, it's only been a week and a half so I'll be sure to keep you updated. Safe to say I've got high hopes for my trio of glow givers. Following my recent trip to the Czech capital I thought I would take the time to share with you a few of my personal highlights. Did I see everything in Prague, no. That would be quite impossible. I took in all of the recommended sights and these are what came out on top for me personally. Will it be a bit obvious, perhaps, but I plan on doing a post on things to avoid too, so look out for that. But onto what I would recommend doing. First of all, I would highly recommend a trip to Prague castle. While it is most definitely a tourist trap, it also has so much to offer. St Vitus' Cathedral lies within the castle complex and is quite simply stunning. From it's Gothic exterior to the intricate stained glass windows inside, it's a sight not to be missed. If churches aren't your thing, head up there for the viewpoint at the beginning. Peer over the walls to capture panoramic views of the city below; all for free. You can thank me later. While my next thing isn't traditional, or Czech, they're too delicious not to include. Trdelník (Trdlo) are sweet treats made from rolled dough which is wrapped around a stick; cooked over coal and then covered in a sugar and walnut mixture. You will find these all over Prague but it is sadly true that not all Trdlo are made equal. If you're looking for something simple and tasty try a cinnamon sugar variant but otherwise head to Good Food in the Old Town for a more gourmet take on this tourist favourite. The Charles Bridge is somewhat synonymous with Prague. It's infamous for a reason and while busy, it's definitely worth a leisurely stroll across. Along the short walk you'll find an array of buskers, ample photo opportunities and endless spots to stop and take it all in. For views onto the bridge or just a quieter trip out of the Old Town, you'll be pleased to know there are two bridges sitting either side of the Charles Bridge. The one to the left brings you right into the heart of Kampa Park and on the right side you'll find yourself appropriately placed to start exploring the Castle. There's less than 1km between each of them so pick whichever suits your vibe and enjoy. Sticking with more well known tourist spots, the Old Town Square is definitely worth a mention. While it may be the busiest spot in all of Prague, it's simply a must see. 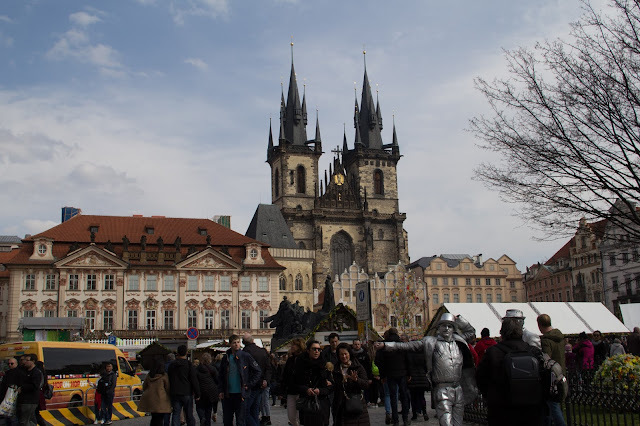 Here lies the world renowned Astronomical clock as well as the Church of Our Lady before Tÿn: two more things to tick off your Czech bucket list. If you're all about the perfect picture, make sure you're up before the rest of your fellow visitors. Head to the square at Midday and you'll honestly struggle to wade through the thousands of people; never mind getting that insta-worthy shot. Hello tall stranger in every single image. Sights aside, you can shop; eat; drink and have a well deserved rest here too. When in doubt, it sort of draws you in as a place to go. It wouldn't be a highlights post if I didn't mention the food. Traditional Czech cuisine is delicious and there's honestly something for everyone. The only thing you might struggle with is deciding where to eat. I obviously can't tell you where the best place in all of the city is but here's what came out on top for me: U Budovce. A quick google search suggests that this place is a pizzeria: ignore that. Having been there twice I can tell you that I didn't see anything remotely Italian on the menu, just traditional Czech cuisine. This place is cosy; affordable and serves damn delicious meals. Their Goulash is rich and hearty and their dumplings are lighter than air: what more could you possibly want? A tip for those of you who are visiting and what help whittling things down: if you see anything western on the menu - skip it. Having western elements to their menus marks them as catering to tourists. As a result these aren't places locals would frequent, so if you're looking for a true taste of Prague, keep looking. Overall, I enjoyed Prague. It's a beautiful place with plenty going for it but I just didn't love it like other places I've visited. Will I be back: sure, just not anytime in the near future. In the spirit of keeping this post largely positive, I'll keep my reasons for another post. Keep your eyes peeled! With a little over a week left till I jet off again; preparations are well underway. Rather than giving you a blow by blow account of everything I'm taking, I thought I'd share with you a selection of essentials. Tried and true items that are functional and don't take up too much space. Playing cards may not be a priority on most peoples packing lists, but trust me when I say they're a lifesaver. Whether you need to provide your own in-flight entertainment or simply need a way to pass a bit of time; cards will be your best friend. If you're travelling solo, they're a great way to break the ice with new friends. Grab a deck and don't look back. I don't journal in my everyday life, but when I'm away I do like to jot down a few things. Namely where I've eaten and also any unique experiences or places I've visited. My Rome journal for example, reads like a Gelato shop directory. But through doing that, I'll know where's good and where I've not been too. So next time you travel slip in a notebook and get scribbling. You'll be amazed at how fulfilling it is to have a more complete selection of memories once you return home. I can look back day by day and see exactly what we did and it's priceless. Odd bits aside, let's dig into all things beauty. Relatively new to my essentials is a mist. I picked up the Caudalie Beauty Elixir while I was in Paris and I really enjoy using it. My 30ml version is the perfect size for travel and it's great for keeping my skin hydrated while on the go. From mid-flight pick me ups, to soothing skin after a hectic day; this spritz does it all. The Caudalie one is my personal preference but there are so many good ones on the market. Pick your favourite and get it packed. As someone who used to travel with full-size bottles of perfume, I now realise the error of my ways. When I'm away, I typically apply perfume once or twice a day, and that simply doesn't warrant bringing anything more than a couple of sample vials. The trick to getting a stash of ones you like is to ask while you pick up that big bottle for your dresser. If you don't ask you don't get as they say. I think it goes without saying that lip balm is an essential no matter what you're doing. As weight is a factor when you've got hand baggage only, it's nice to find an item that can take care of your lips and so much more. Take Glossier's Balm Dot Com for example, it works a treat on all manner of dry patches and doubles as a great highlighter too. This next item I want to gloss over really quickly. You lot know how much I love it so I won't continue with my shpiel in this post too. I feel ready to face the world when my brows are done. A quick few brushes with Glossier's Boy Brow and all is right with the world again. Blush and eyeshadow may be alluring but nothing can transform your face quite like your brows. Stick your favourite brow gel in and thank me later. No brushes or blending needed! Boy Brow aside the only other makeup item I couldn't travel without is a great concealer. Whether you're trying to hide the signs of a late night or need a little help evening things out, it's a must-have. For my needs, I'm partial to a little Glossier Stretch Concealer but there's a concealer out there for everyone. Find yours and get it packed! Skincare wise, I've always brought along decanted versions of all my usual products. All except a mask that is. I just thought it was too much faff and that I'd never have the time. Little did I know that it's the one thing my skin really needed. With all the air travel, unfamiliar water, and varying temperatures, it's good to give the skin a bit of a thorough clean and refresh. If you aren't already giving your skin a little TLC, I'd highly recommend picking up a mask before your next adventure.For my two upcoming jaunts, I'm taking the Omorovicza Deep Cleansing Mask as well as my Hydraluron Sheet Masks (not pictured and potentially discontinued). To round things up, I honestly don't think it would be an essentials post without a travel-sized dry shampoo. I tried to go away without a can once and that ended with a trip to the pharmacy soon after landing. You will always use it (unless your hair is very dry), so don't risk flying without some. The Klorane one pictured is absolutely fabulous but Batiste works just as well. After it's more than successful UK launch last October, Glossier still had gifts to give. This came in the form of their first foray into the fragrance market. 'You' launched to much fanfare and if the reviews are to be believed, everyone was simultaneously wearing it and loving it every day. So what's it all about and is it even really that good? The USP if you will of this perfume is that it's personal, "you are the first ingredient" to be exact. After your own fine scent you'll notice notes of 'ambrette; ambro; musk; iris root and pink pepper'. I'm not a fragrance expert so I'll give you my take on what all this smells like when it's put together. Using adjectives only I'd say it's clean, milky, spicy and non-offensive. Note that those aren't words used by Glossier themselves. Told you, not an expert. They say it should be 'warm; comforting, addictive, spicy and sparkling.' Almost got it. But did I like it or not? The short answer is yes but and it's a big but: I wouldn't repurchase. It's a perfectly nice fragrance but I find it to be completely forgettable. The scent disappears into my skin and becomes invisible to the nose. When I ask people what they think, they find it hard to detect if I've applied anything at all. For the princely sum of £45, I had higher hopes. After giving it a shot myself, I'm now struggling to see what all the fuss was about. More importantly did everyone else really love this? I'm not so sure. Glossier fans rejoice; we can now order the entire line within the United Kingdom. No longer do we have to beg friends travelling to the states or set up dodgy PO Boxes. For those of you who haven't a clue what I'm talking about, let me give you a bit of background. Founded by the guys and gals behind Into The Gloss, Glossier create beautiful, functional, no-fuss beauty products. Their motto is "skin first, make-up second, smile always' and who can't get behind that? As you could've probably guessed, they started with skincare, progressed to make-up and now they've set their sights on the fragrance and body care markets. Best thing of all is that I've yet to encounter a dud product. Everything I've tried has been brilliant and nowadays I feel that's such a rare occurrence. So when Monday came around, what did I end up ordering? If money was no object, I probably would've ordered everything truth be told. I was good though and only ordered what I 'needed'. Here's what made the cut.. The first item that went straight into my basket was actually their Stretch Concealer (£15). I've had little to no luck with concealers and I was sold on the idea that this didn't crease. go flat or cake up. Needless to say it's everything I'd want out of a concealer. It looks luminous, actually doesn't crease and it always blends in seamlessly. It's a miracle in a jar I swear. Obviously if you need higher coverage, I'd probably skip this but for the rest of you, go buy it! Since receiving mine I've skipped all other base products and just used this where I needed instead. Game changer. For reference, I have this in the shade light and while it does look alarmingly orange, it's perfect for fair skins. I'd be surprised if anyone didn't purchase at least one shade of Haloscope (£18) last week. With Glossier famed for their glow giving products, there was no question one of these would be winging it's way to me. The only bit I struggled with was what shade to pick. In the end I surprised myself and opted for Moonstone and I've honestly no regrets. While it does look really white/silvery in the bullet, on the actual skin it looks like I've got a natural sheen. I also love the fact that this doesn't set. I've been using the Wander Beauty equivalent for a while and while it's nice, I've never been a fan of it's almost cream to powder formula. Haloscope goes on dewy and stays dewy and I love it. Yes it does mean my hair sticks to my face in the wind, but it's totally worth it. Sticking with classic Glossier picks, it wouldn't be an order without at least one tube of Balm Dot Com (£10). Into my basket went both the Birthday and Coconut varieties and they're yet another resounding success. The packaging is super cute and neither have left my handbag since I received them. Are they expensive for what is essentially Vaseline; sure but that won't stop me from repurchasing. The last bit of make-up I picked up was their Boy Brow (£14) in the shade Brown. This hasn't disappointed me but it hasn't rocked my world yet either. It does a great job of tinting and holding my brows, but so does the L'Oreal one I've been using for ages (that's half the price might I add), so the jury's out on this one. One thing I will give them is that it provides the same level of hold but it manages to not feel stiff like the L'Oreal one. So that's a win I suppose? Almost there but I couldn't not pick up a bottle of their famed Milky Jelly Cleanser (£15). I am 1000% sold on this stuff. I've used it morning and night since I got it and my skin is calmer, more even and less prone to dehydration lines. Just a tip though, you probably won't want to use this to remove your make-up. It's a great cleanser but make-up removal it is not sadly. To round things up I was lucky enough to receive a sample of their forthcoming fragrance 'You'. I do like it, but it's not what I thought a Glossier scent would smell like. It's practically identical to Versace's Bright Crystal, which isn't necessarily a bad thing; just not what I'd expected. Glad I had the chance to try before committing to the full size though. So there you have it, my first impressions of Glossier. I've waited so many years to get my mitts on their products, so it's been a relief that I've not been disappointed (yet). That being said a lot can change after a few weeks of solid use, so I'll be sure to keep you posted. Other than that, Glossier gets a thumbs up from me. So if you're thinking of placing an order, get stuck in! Timing is everything. I went mid-afternoon (lunchtime-ish) and it was the perfect time to shop. It wasn't empty by no means but there was a good amount of space to shop and there were assistants available too. Bonus. Before my visit, I'd heard rumours of stock running out and not being replenished, but I saw nothing of the sort so don't get up before the sun if you catch my drift. If I were you I'd avoid opening times at all costs; instead grab a pastry and wander over the river at your leisure. Be prepared. Because of the vast quantity of product available, it's really useful to have a list of 'must haves' before you get there. That way you can grab what you really want before you get sucked in by all the other goodies on offer. Ask questions. The assistants at Citypharma are excellent, so if there is one free, definitely make use of their expertise. Whether you're completely new to French pharmacy skincare, or a seasoned pro, you will always learn something from them. So go ask, and find your perfect routine. If you want to go solo, the aisles are arranged by brand so it's pretty easy to get around without an assistant too. Just be prepared for the sheer amount of products available. So much product you guys. Cult beauty at the pharmacy. While skincare products are on the first level, if you venture upstairs you'll find a whole host of must haves of a more pharma nature. Products like Homeoplasmine (ask a pharmacist for this) and Biafine sit amongst toothbrushes and the likes, so it's definitely worth a trip up the stairs. it was that good. I left euphoric and it truly was everything everyone said it would be.